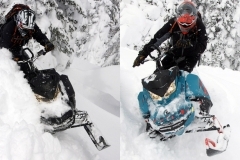 The 2019 Ski-Doo Summit X and Freeride may have different names, but they are very close siblings that share an awful lot in common. 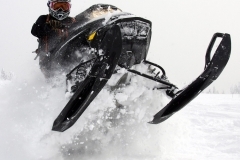 The fourth generation REV chassis Summit, simply known as Gen4 or G4, is the chassis that possibly made Ski-Doo the leader in mountain snowmobile sales. 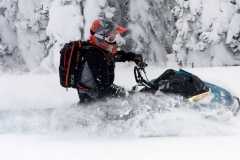 Though sales numbers are closely held close by the International Snowmobile Manufacturers Association (ISMA) and the original equipment manufacturers (OEM), dealers who sell Ski-Doo’s mountain snowmobiles, and one or more competing brands with two stroke-motors (Arctic Cat and/or Polaris), mentioned to Snowmobile.com that Ski-Doo’s Gen4 850 Summit (X or SP) and Freeride were purchased more by mountain customers than the other brand’s models. But we also heard that mountain bangers still bought 2018 Pro-RMKs in drove. 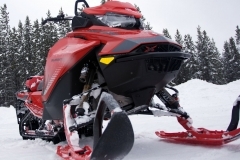 Not to end here, Arctic Cat’s Mountain Cat for 2018 was a huge success, and its mass volume on the mountains can’t be discounted. With 2019, Polaris brings to market an updated Pro-RMK with 850-power (the Patriot 840) and a new front end — React Front Suspension. From Arctic Cat comes a new premium Mountain Cat, the Alpha One. 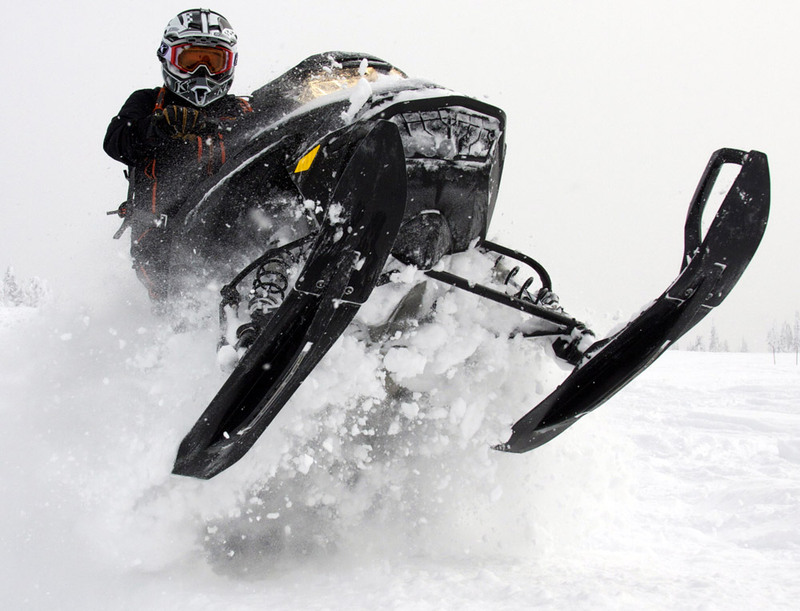 For this next mountain snowmobiling season, Ski-Doo may find its sales on the 2019 Summit X and Freeride challenged by Polaris and Arctic Cat. 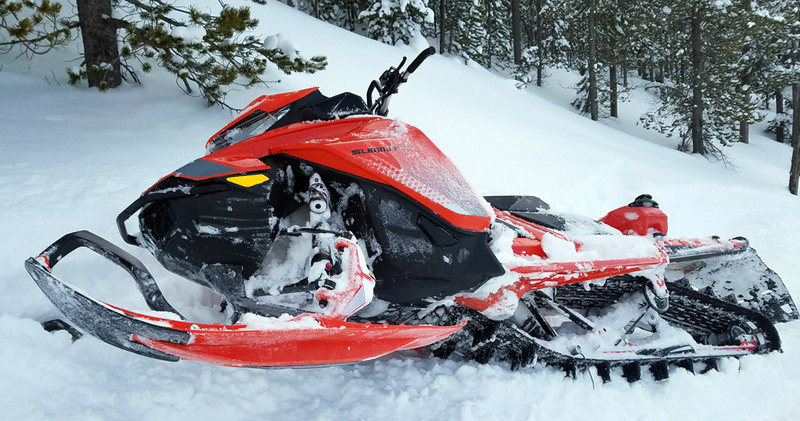 From our perspective, the shine on the Gen4 2019 Ski-Doo Summit X and companion mountain masher, the Freeride, is not tarnished. In fact, we see the three – Alpha, Pro-RMK and Summit/Freeride – becoming heated contestants more than in 2018. We focus here specifically on the long tracks, the 154 and 165 Summit X and Freeride. In 2017, we spent a full season on a G4 Summit X 165 and we sobbed when we returned it. For 2018, we spent the season riding a G4 Freeride 165 and when we returned, yes, we sobbed again. Ya at times, we’re not so tough. For this feature, we couple together the 2019 Summit X and 2019 Freeride, as these are siblings, twins per say, with one wearing light all-terrain backcountry running shoes (shocks), the other wearing light all-terrain hiking boots (also shocks) and knee guards (runningboard and hyfax rail reinforcements). Other than these few differences, the G4 Summit X 154 and 165 is the same as the G4 Freeride 154 and 165. History reminds us that during the XM days, the XM Summit X and the XM-RS Freeride were as dissimilar as they were similar. These two were more cousin-like than they were siblings. Besides being a backcountry plaything, the Freeride had some crossover bloodlines that made it suited for competition hillclimbs and limited fast-attack ditch whacks. We rode these XMs and felt the Summit X was nimble and playful. 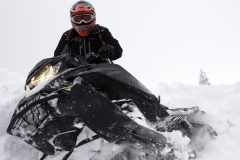 Oh, but the Freeride was a snowmobile that liked to be dropped from tall cornices. All this changed as modelyear 2018 came to be. The Freeride became all Summit X-like. Often times, we refer to the Freeride as the Summit Freeride. 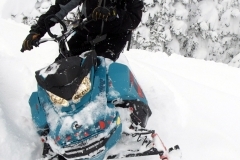 But, Ski-Doo labels the Freeride outside the Summit model; it is its own. We disagree with that, as we lobby the Freeride ought to be the “Summit Freeride.” That’s just an opinion. 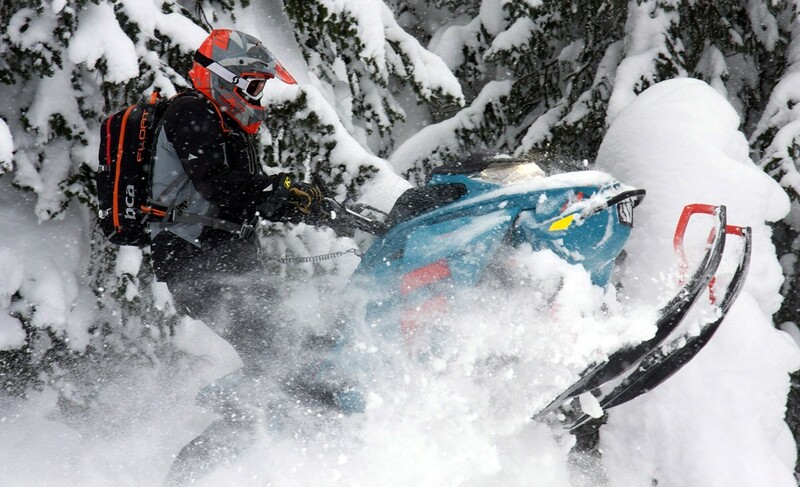 A Rotax 850 E-Tec motivates both the 2019 Ski-Doo Summit X and the Freeride. The motor displaces 849cc, is a twin cylinder two-stroke motor that is liquid cooled, has electronic direct injection and has electronically controlled exhaust valves – eRave. With a narrow and tall stance, the Summit X, as well as the Freeride, are deep powder savvy. Shown is the Fox 1.5 Zero QS3-R front shocks as an accessory. The motor’s direct injection features cylinder head voice-coil injectors that deliver a precise fuel and oxygen mix. Also the 850 has booster injectors that sit atop the motor on the intake side. The idea behind the booster injectors is to deliver to the motor an added “boost spray” (air-fuel mixture) when the motor’s throttle is snapped hard at mid-range and high RPM. To simplify this is to say the boost injector system is like a mini nitrous system. Not as radical as nitrous, but works in the same concept using the snowmobile’s own fuel. And so, what does this mean to the Summit X and Freeride? 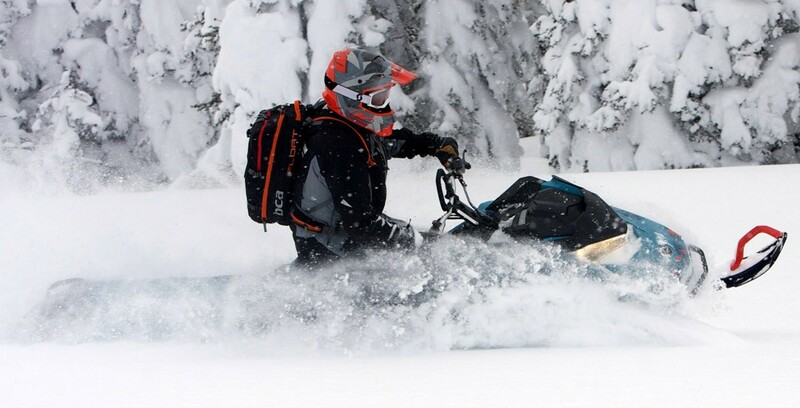 These powder hounds are grunt-filled mountain snowmobiles. Throttle response is always snappy, precise and there when you need it; when it comes time to hit back at a mountain that is trying to defeat the climber and his or her mission, the big 850 with boost injection gives the Summit X and Freeride the extra oomph to hit back and win. The 849cc Rotax delivers its peak 165 horsepower at 8,000 RPM with more than 106 lb-ft of torque. 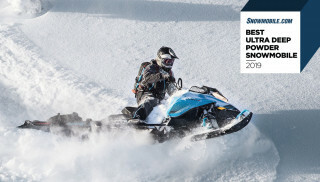 To free up the power of the 2019 Ski-Doo Freeride and Summit X and help deliver it to the track is the pDrive clutch. The pDrive has friction-free dual rollers instead of sliding buttons. The oversize rollers with needle bearings, wide flyweights and shaft-on-shaft design give the Summit X and Freeride smooth shifting. 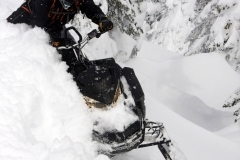 The Freeride and Summit X rely on Ski-Doo’s RAS-3 front end with unequal length A-arms. This front suspension is easy to mash into a hillside, is silky smooth to turn and provides excellent control in harsh conditions. 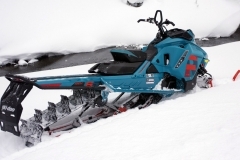 For a mountain snowmobile, the Summit X and Freeride are pleasant critters to mogul bash. Under the tunnel for the Summit X and Freeride is the tMotion rear suspension wrapped by the PowderMax Light track with FlexEdge technology. Says Ski-Doo, “The tMotion flexes laterally, reducing the effort to initiate a roll, due to a ball joint at the center hinge between the rear arm and drop link and split flat-tube front arms. Very progressive motion ratio makes the ride on trails even more comfortable.” The FlexEdge track is a 3.5-inch pitch track that is 16 inches wide. It is available for both the Freeride and Summit X in either 2.5-inch high lugs or 3.0-inch high lugs. 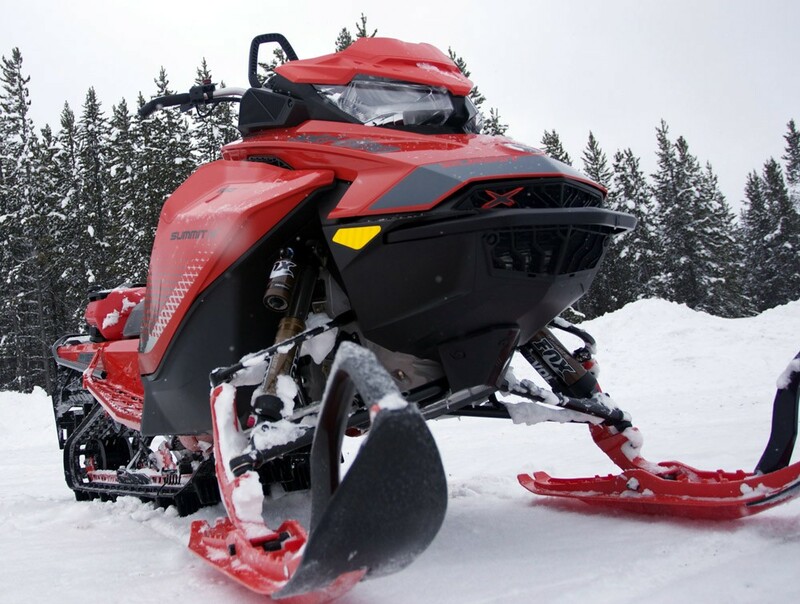 The track’s wide footprint makes the 154 equal to the other OEM’s 160s with 15-inch wide tracks, and the 165 Freeride and Summit X equal to footprint on the snow, to Polaris’ 174 Pro-RMK, which has a 15-inch wide track. From several years’ experience, the tall three-incher is the track to have. For all 2018, our Freeride 165 spun the 2.5-inch track, and only in rare instances when in waist deep powder and greater, did we find the 2.5-inch track lacking forward momentum. Meaning, the 2.5-inch track is an excellent PowderMax Light track. Don’t be scared to own a G4 with one. Now we come to the differences. The Summit X has at all impact points (four) HPG Plus shocks. These are light premium high-pressure gas shocks with coil over springs. We’ve never had a shock failure in our years beheading mountains. The Freeride’s front shock is a KYB Pro 36 R Easy-Adjust. The rear suspension front and center shock is the KYB Pro 40 Easy-Adjust. These shocks are the same as on Ski-Doo’s MXZx 600RS race sled. These are coil over remote reservoir shocks that are rebuildable. The Easy-Adjust compression damping-knob eliminates the need for tools to adjust the shock’s dampening. Ski-stance widths for the 154 and 165 Summit X and Freeride is 35.5 to 37.5 inches. However, there is a Freeride 154 S-38 where its ski stance is 38 to 40 inches; this is the true hill cross, or competitive hillclimb snowmobile. There is no 154 Summit X S-38. The last difference is the Freeride 154 and 165 have runningboard and rear slide reinforcements – to handle impact energy from long drops. These add some weight, but minimal, to the Freeride. 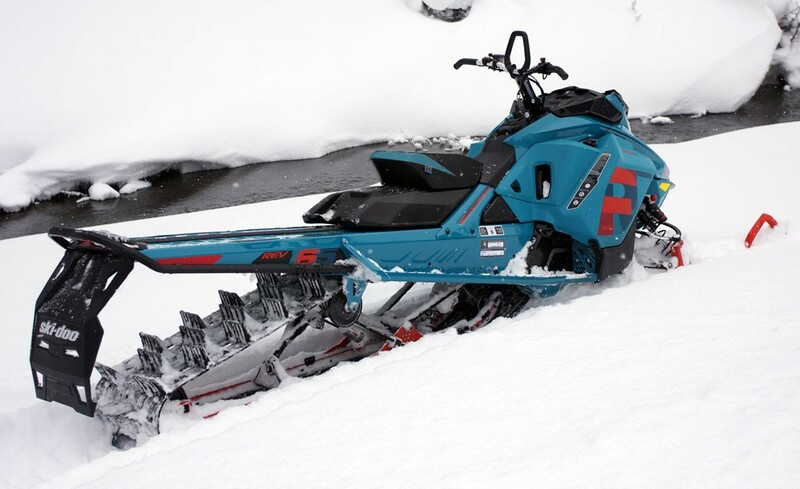 The G4 Summit X and Freeride are highly-capable mountain snowmobiles. Each is easy to initiate a sidehill cut, and is gentle to maneuver. The G4 chassis is quick. Deep-powder carves are simple to lay down with minimal body input to the chassis. Most riders can carve by straddling the seat, dipping the inside shoulder, lifting the outside foot from the runningboard and applying pressure to the inside runningboard. Through the trees, each does not fight its operator. Now, advice we give here is to equip your Freeride or Summit X with a handlebar riser that is optimum for your height and arm reach. 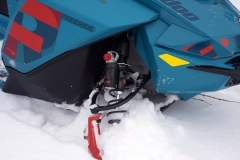 The handlebar riser shipped with each Freeride and Summit X is general for all riders, which works well, but to get down and nasty with a sweet snowmobile, order from Ski-Doo’s accessory catalogue the bar riser that works best for you. 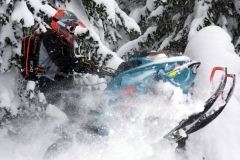 We also recommend the Adjustable Toe Holds and Knee Pads from Ski-Doo’s accessory line. 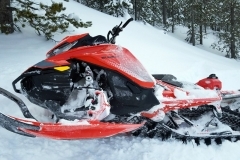 For several days, we rode a 2019 Ski-Doo Summit X 165 with these, and in the deepest and sweetest snow with trees as picket fences, we came to appreciate what these did to enhance our riding experience. 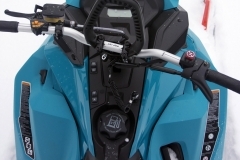 We also give a plug for Ski-Doo’s accessory tMotion Remote Limiter Strap Adjuster. Adjusting weight transfer as needed/when needed takes mountain climbing and boondocking to a higher-than-belief-level. The Freeride and Summit X are highly nimble powder players with great ergonomics, a narrow chassis that doesn’t panel out, and runningboards that clean off well. 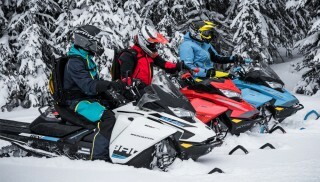 These mountain snowmobiles are great for beginners (though we think the 600 Summit SP is the best-of-the-best for newcomers) and for seasoned riders who want to elevate their game. 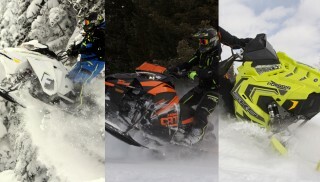 However, Polaris’ new 850-powered Pro-RMK with its new nimble React Front Suspension, and Arctic Cat’s Alpha One Mountain Cat with single beam Alpha rear suspension will challenge the 2019 Ski-Doo Summit X and Freeride in the nimbleness and effortless categories; 2019 will be an interesting year to see which brand and model claims the “flickability” badge-of-honor. 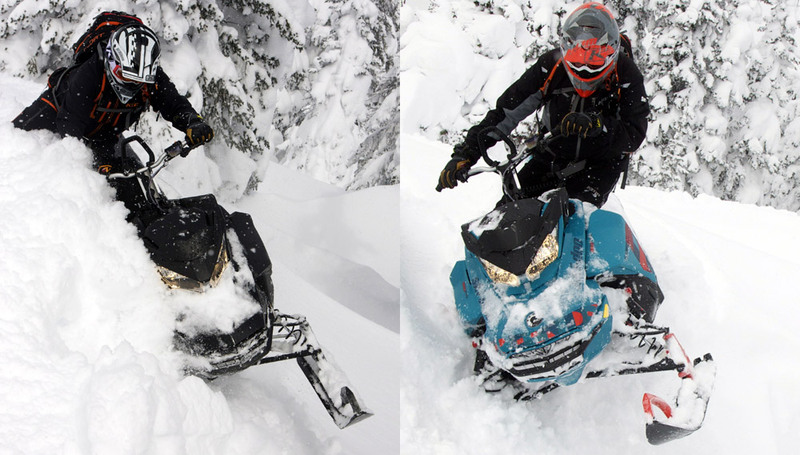 Yet, the Gen-4 REV Summit X and Freeride 154 and 165 continue to be everything Ski-Doo said these would be; we’ve verified Ski-Doo’s “everything” claims. These are light, agile, nimble, effortless and powerful. In fact, these two are wildly agile, nimble, effortless and powerful. Motor strong? Check. Narrow chassis? Check. Agile, nimble, effortless, powerful? Check and check and check again.